Uel be sad you missed this. What is so satisfying about that fresh, hot cup of coffee? Is it steam, carrying the scent around your nose? Is it the fragrant aroma that wakes you up after your late night study binge? What makes a good cup of coffee, good? For November’s #SpoonSenses theme, we decided to do an experiment with coffee and learn how it affects our sense of smell and taste. Cold brew, we heard, is smoother and easier on the palate than drip coffee. We wanted to find out for ourselves if this was true or not. On the 700 block of W. Kirkwood Avenue, a little shop sits tucked away in what looks like a small house. This cute little shop is known as the Uel Zing Coffee Lab which was opened in 2013 by Samuel Sveen. This shop provides Bloomington residents with the strong, smooth taste of cold brew coffee. The name, he explained, was inspired by the phrase “I’m gonna zing”, which he used to express his reaction to the caffeine of the coffee/espresso, while working at Gimme! Coffee in Ithaca, NY. The “Uel” comes from the end of his name (Samuel) and also a play on words for “You’ll”. A common misconception about coffee is that the darker the roast, the more caffeinated the coffee is. This, however, is incorrect. Light (also known as a “blonde” roast) has the highest amount of caffeine of all roasts of coffee. Apparently, lightly roasted beans have more caffeine because they are denser. The longer you roast the beans, the more water evaporates taking the caffeine with it. So what is Cold Brew, you ask? According to Uel Zing’s website, it is 60% less acidic than hot brew and has double the strength. This process actually creates a concentrate, known at Uel Zing as “CONK” (large bottle above). When you cut it 1:1 with water, you will have the perfect iced coffee (no cream and sugar needed). The device used? A big yellow bucket (aka the Uel Brew 10000) and a linen bag. 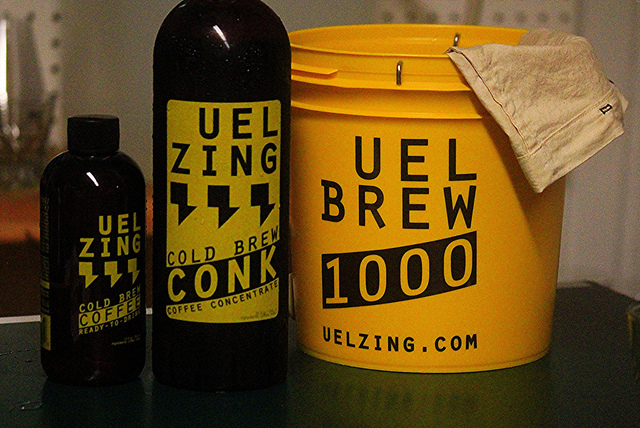 If you would rather brew your own at home, you can buy the mini version – The Uel Brew 1000 (pictured above). If you don’t have 24 hours to spare and need a smooth cup of coffee right away, maybe you should try the pour over method. 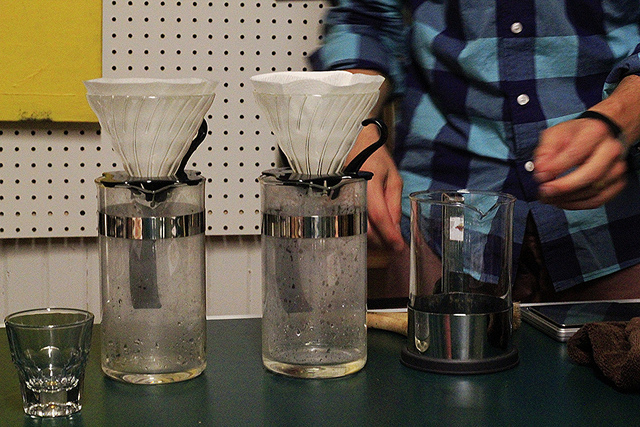 Using a funnel, such as the Hario V60, available for purchase at Uel Zing. Check out this website for more information on the technique and a how-to guide. To start off our evening, Sam offered us some cold brew iced coffee while he set up the demonstration table. Following the iced coffee we sampled the CONK, the ultimate wake up call. It’s got a little more than enough caffeine to get you going morning, noon and night; but without the bitter taste of drip coffee. By the end of the night we were certainly zinging! We tried other coffees as low quality as Bustello to as high quality as a locally roasted blend (aka the Uel Zing Blend). 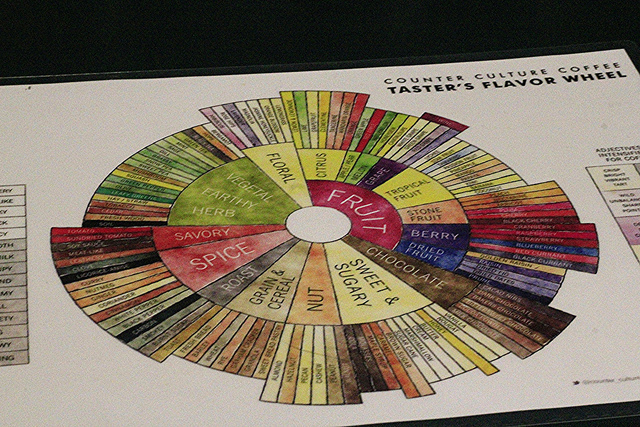 While sampling this wide variety of flavors, we were given copies of the counter culture coffee flavor wheel (pictured below) to help us describe what exactly we were tasting. It was quite entertaining (and we even came up with some nifty Spoon IU codenames with the different choices). After trying all of the tasty coffees, we certainly didn’t want to go back to Maxwell House the morning after! If you’re curious about where the cart might be, or what events are going on in the lab check him out on Facebook, Instragram and/or Twitter.